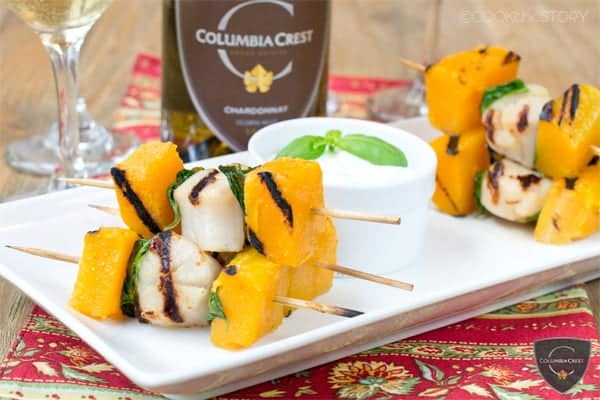 These Grilled Scallops, Butternut Squash and Basil Skewers are quick and easy to make but are so elegant you’d never know it. They’re served with a simple garlic dip. I’ve paired this dish with a Columbia Crest Grand Estates Chardonnay. This recipe is sponsored by Columbia Crest. 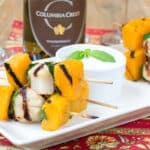 To see all of my Columbia Crest wine pairing recipes click here. If you can find one in the shell, that is. Usually scallops are sold as just the adductor muscle, with no other body part or shell attached. Although, when I’ve been in the UK I’ve sometimes had scallops served with what is called the coral attached. The coral is another soft edible part of the scallop. But I wasn’t particularly fond of the flavor of that part. So just as well that I live in the US where we just get the adductor. The big advantage of scallops being sold cleaned and out of their shell is that they make for a quick and convenient food to cook. Because they cook so quickly, they’re perfect for the grill and perfect for tailgating. To make the scallops in this recipe really fit with the tailgating fall season, I added par-cooked butternut squash to the skewers. But to remind us that summer isn’t over yet, there’s a bit of basil on there too. To make these skewers you first simmer cubes of butternut squash just until tender. Then you thread the squash, scallops and basil onto skewers and put them on the grill. They’re ready a few minutes later. While they cook, whip up the quick garlic dipping sauce and you’re ready to eat. When trying to decide on a wine to pair with this dish, I was naturally drawn to a Chardonnay. Chardonnay goes beautifully with seafood, and especially with the sweet and salty scallops. It also loves the buttery creamy flavors of butternut squash. In particular, the orchard fruit and buttery flavors in Columbia Crest Grand Estates Chardonnay create a lively, vibrant wine that really complements the flavors and textures in this dish. You’ll love every bite. And every sip. 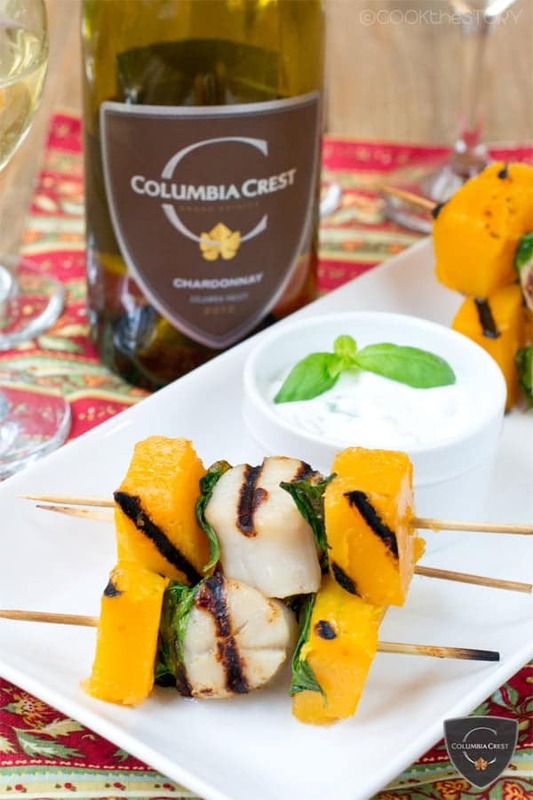 The sweet yet salty scallop and the buttery squash are a perfect match for the Columbia Crest Grand Estates Chardonnay. The orchard fruit and buttery flavors create a lively, vibrant wine that complements the scallops in this dish. Note that you can cook the butternut squash ahead of time for this dish. Then pack all of the ingredients separately and keep them cool until you're ready to assemble the skewers. Grill them immediately. Onto a soaked skewer thread a cube of squash, a basil leave, a scallop and then another basil leave and another cube of squash. Repeat with remaining skewers. Grill until scallops are just cooked through, about 2-3 minutes per side. *The info about finding out a scallop’s age comes from fishwatch.gov.